Although his themes or subjects appear to be at random, there are recurring elements in the photographic work of Dutch photographer Paul Boekhout. It was Helmut Newton who said that “a good photograph starts with having a camera stand by!” Newton always had a compact in the dashboard of his car. And so does Paul Boekhout. I can’t remember meeting him without having a camera nearby, and we have been working together for many years already. Paul Boekhout is clearly influenced by 20th century photographers working for the photopress agency Magnum. Studying master photographers like René Burri, Philip Jones Griffiths, Werner Bischof, Robert Capa and above all Henri Cartier-Bresson, taught him to recognise the extraordinary in everyday situations. While classic photojournalists had little interest in the printing process, and contemporary ‘visual artists’ mainly work digitally, Paul Boekhout still has this soft spot for dark room printing. Like with his passion for vintage cameras, he is attracted to traditional wet printing techniques from negatives, ranging from small to large format. His equipment is a combination of digital and vintage cameras covering various film sizes. 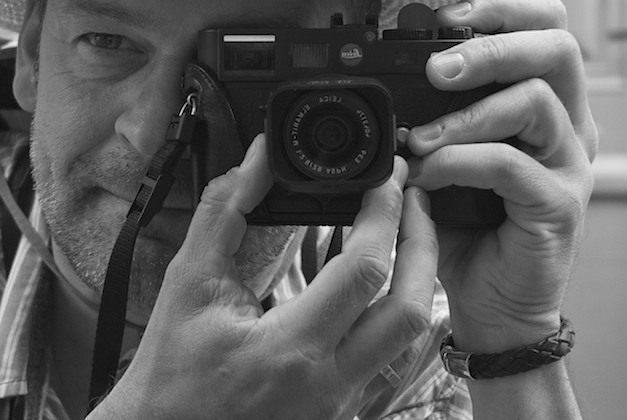 When travelling, the Leica M rangefinder camera is his main photo reportage tool. Depending on the camera system, his photographs range from spontaneous captures to well-balanced compositions and close-up portraits. Many times, a strive for technical perfection leads to clean or cold results. But in his case there is always that beautiful warm grain and compassion with his subjects. Collector and Curator of Galerie ’t Fotokabinet.